For K. Rasool, a Humanitarian Action master’s student at the RUG, making it to the refugee camp in Iraq was a hard-won achievement in itself. Doing an internship to help people in need was his dream come true. While he was underway, the transition camp in Iraq where K. would intern was declared a Level 3 Emergency, meaning it was too dangerous for interns to work there. He convinced his supervisor to give him a chance, and K. worked on the UNHCR protection team with the elderly, the sick and unaccompanied children. One project close to his heart was trying to get toys for the children in the camp. He worked hard not to stand out as a westerner out of concerns for being targeted by nearby IS fighters. He worries about his former colleagues who give 120 percent each day at the camp and, if he can, definitely plans to go back. 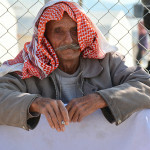 He reached the refugee camp in Iraq after almost five days of driving. When he finally arrived, everyone seemed busy – they quickly told him that the United Nations had declared a Level 3 Emergency while he was underway. That meant the UNHCR could not employ interns during such a high security risk. What now? K. Rasool’s dream to help people in need was itself in danger. ‘I was afraid that I might have to go home after I planned this for such a long time’, says K. But he was determined to fight for the job he was so passionate about. He understood that the last thing the UNHCR wants in such a situation is an intern, but he felt certain that he was the one who could do the job. After several long conversations, he convinced his supervisor to give him a chance. He was willing to take the risk. 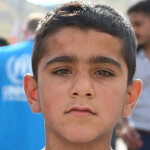 ‘If you believe in something, you have to fight for your ideas’, says K.
The first few days were overwhelming for K. and he needed some time to process that he was actually in a refugee camp of 500 people near the Iraqi-Turkish border. ‘It’s different from the images you see in the media.’ It was a Kurdish transitional camp that takes care of incoming refugees who are then transferred to other camps. People would typically stay for one day for a medical check and vaccinations, then they would be sent on to other camps across the Kurdistan region. At the camp, almost everyone was a refugee of the city of Kobani. The city on the Syria-Turkish border was largely destroyed during a violent, months-long siege by IS fighters – 192,000 people fled the fighting. 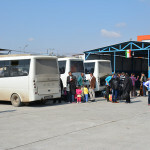 For those not lucky enough to catch a bus for the one-day journey, it took two weeks on foot for refugees to make it to the transition camp – K. even recalls some families who came to the camp with young children who traveled for three months with stops in between. Last year, the UK interviewed K. Rasool as he prepared to drive across Europe to intern at a refugee camp in Iraq. Due to safety concerns, the original article was taken down and his internship location was changed. We have republished it now that he has returned safely to Groningen. After K. settled in himself, there were still a few matters to take care of. Since the UN had declared a Level 3 Emergency, K. had to notify the Dutch Embassy about his whereabouts and his employment in case anything went wrong. After finding a place to stay near the camp, he was finally able to start working. ‘It is difficult to describe a usual day in the transitional camps – every day was different.’ Each morning, he woke up at 6 AM and drove from his apartment to the headquarters to receive his assignment for the day. In the beginning, K. was assigned to a UNHCR protection team. Their responsibilities were to care for vulnerable people in the camp, particularly elderly people and unaccompanied children. K. helped arriving refugees and at times also relocated those refugees to different camps. He recalls one elderly woman who made that choice. She had to take care of her children all on her own because her husband was killed. ‘She also had a heart disease, which made it even more difficult to provide for the whole family.’ Even though he was surrounded by suffering, he felt fortunate that his dream had finally come true: he was there, and he could help these people. K. usually finished his assignments around 7 p.m., but still had to write daily reports for UNHCR before he went to bed. He was soon an essential part of the team. A matter close to K.’s heart was his attempt to get funding to provide the children with toys. Considering what these children had been through, K. describes this ‘grey layer’ that he could see covering them. During his stay, he heard the stories of orphaned children who came alone to the camp: ‘Some told me that they have witnessed both of their parents being killed’, says K. It wasn’t easy for them just to be normal children with such a burden to carry, he says. He soon realized that he would never get funding for toys to entertain the children, but K. luckily received private donations. ‘It was so easy to break this grey layer with a toy or a book,’ says K. ‘It was the first time they smiled while being in the camp.’ Achieving this was especially important for him because these children are the ones who will have to rebuild the country in the future. Seeing this misery also affected K. personally. ‘As an aid worker, you have to try to deal with the things you see as soon as possible – otherwise, you become a hopeless case.’ His way of coping was to focus on information. He tried to gather as many details as possible about the regions where the refugees came from in order to be prepared to hear their stories. Focusing on the details helped him to process the experience better. 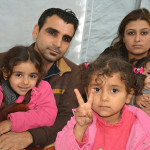 ‘There is no space in a refugee camp for an aid worker to sit around and complain’, says K. He didn’t want to become a burden for the organization or his own family. After he helped the refugees to settle in, K. used the opportunity to start informal conversations to understand what the people were going through. ‘I never came across IS, but if I had, I would have asked them multiple questions.’ K. considers himself lucky because he never encountered IS during his stay, but he was very aware of their proximity. The area where the Kurdish transitional camp was located was surrounded from almost all sides by IS, he says. ‘Sometimes, we heard gunshots. They do that just to show their presence.’ The refugees told K. what they heard at night: ‘You could see the fear in their eyes.’ Other refugees who came to the camp told horrible stories about encounters with the terror group. The news of the beheadings of Westerners by IS also traveled to K. during his internship. He tried to focus his energy on his work and ignore the threat. ‘They want to scare you, but you shouldn’t fall for that’, says K. ‘Once you do, you become a mobile victim; they try to control you from a distance.’ Be that as it may, he also says that people shouldn’t take the circumstances too lightly and should avoid stepping into those dangerous situations unnecessarily. In order to hide that he’s a foreigner and thereby hide from IS, K. tried to blend in with the community. ‘You have to be careful what laptop you are using, what water you are drinking and what clothes you are wearing.’ They are observing the information they can get and if foreigners show that they are not part of the community, they are an easy catch, he says. He wasn’t only concerned for his own sake. ‘There is a lot on the line,’ says K. ‘I would have endangered the whole team with wrong behavior.’ If something were to happen, security providers and other help might stop working with the camp, he says. The most striking experience for K. was to see how much a human being could go through. ‘We always think we’re the strongest, but I realized how vulnerable we are.’ It was an eye-opening experience for him to meet people in these circumstances. Being back in the Netherlands also made him realize how much people take for granted who don’t live in such conditions. ‘Things like electricity, heat, or running water are a luxury for a refugee or people in conflict zones’, he says. He is definitely a changed man with a different outlook on life, he feels. After returning to Groningen in early February, K. first had to get used to biking again. But he still looks like a globetrotter, carrying a green backpack full of photos and experiences from his trip. Right now, K. is working on his master’s thesis and he will most likely be finished with his studies in June 2015. But just like before his last adventure, K. is once again rubbing his hands together in anticipation. ‘I definitely want to go back and I hope they will hire me’, he says with a smile. K. explains that everyone who works at the camp is giving 120 percent. But he worries how long the people there can continue working 14 hour days, seven days a week. They are simply overloaded with the high number of refugees. Even on Christmas, it’s just like any other day: a struggle to survive. But no matter how exhausting the work is, it remains his passion to help people in need. Before K. was able to go to Iraq, he had to convince his supervisor from the Humanitarian Action department. At first, the programme manager of the master was strictly against K.’s idea – he was told it wasn’t possible because it was too dangerous. For all internships, NOHA consults the Dutch Ministry of Foreign Affairs travel advice. According to NOHA Groningen director professor Joost Herman, only a negative travel advice – code red – would be grounds to turn down an internship request. Before his internship, K.’s supervisor was in contact with his would-be UN supervisor in Iraq and ‘got the assurance that K. would be part of the regular UN staff’, Herman says. That meant liability issues would apply to the UN rather than the RUG. The nature of the NOHA programme permits students to do internships in the real world – that means living and working in trouble areas where humanitarian organisations like the UN are providing aid. ‘The professional ethos of such organisations not to put interns – inexperienced persons – into harm’s way is the second safety valve built into the system’, Herman emphasizes. However, things didn’t go exactly according to plan. K. was supposed to do his internship at the Domiz camp in Duhok, Iraq, but the UN decided to reassign him out of concerns that too much identifying information had been made public in the original UK interview. K. was sent to the transition camp for his internship instead.